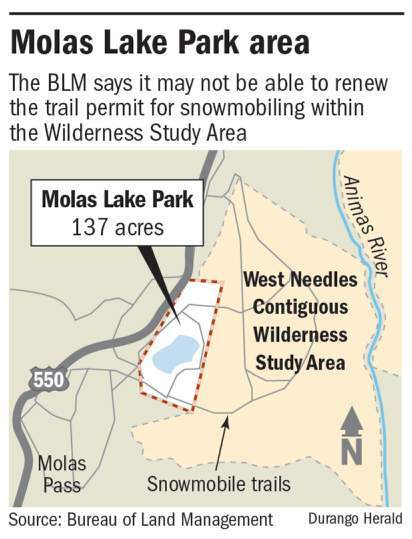 Nearly 1,000 acres of Bureau of Land Management acreage adjacent to Molas Lake Park that has been used as a snowmobile playground for decades may soon be off limits to all motorized use. Jeffrey Christenson, outdoor recreation planner for the BLM Tres Rios field office in Dolores, said the area in question is the West Needles Contiguous Wilderness Study Area. New guidelines for management of such areas were released in July last year. Christenson said Tuesday that those rules basically prohibit snowmobile traffic and require the BLM to manage the area as if it were actually a designated wilderness. However, the BLM has allowed snowmobiling to continue in the area this winter. Christenson said BLM staff members have been working with snowmobilers to figure out what to do next. Jim Lokey, president of the Silverton Snowmobile Club, said until the last year or so, the BLM land in San Juan County was managed through the Forest Service Columbine Ranger District. That has since changed, with the BLM land in the county now managed by the BLM field office in Dolores. The BLM looks at things a little differently than the Forest Service does, Lokey said. Lokey said the popular snowmobiling area has been used by the snowmobile club for at least 20 years. We go back as far as the winter of 1992-93 with our grooming permits in the area, Lokey said. And he said two snowmobile tour vendors operate in the area on BLM permits as well as the Durango Dog Ranch dogsled outfitters. The area represents only a small portion of the 104 miles of trails the snowmobile club maintains. But Lokey said its a very popular area. Its a big family riding park for the snowmobile club, Lokey said. The snowmobile clubs five-year permit to groom trails in the area is coming up for renewal. Christenson said if snowmobile trails in the area followed established roads they might be permissible, but there are no established roads for the snowmobile trails to follow. San Juan County commissioners plan to set up a meeting with BLM officials to discuss the matter. County Commissioner Pete McKay said he has requested that the BLM provide a timeline and supporting documentation on the wilderness study area and its management criteria, going back to at least 1976. Its a very critical part of the recreation up at Molas, and weve been using it for many years, said County Board Chairman Ernie Kuhlman. County Commissioner Scott Fetchenhier said losing snowmobiling in the area could have a huge negative effect on Silvertons economy.